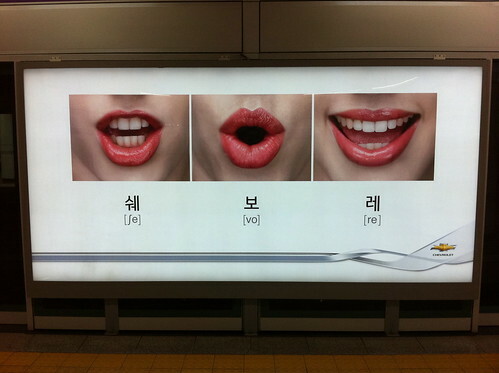 Seen at Yeoido Station, this advert for Chevrolet seems a little misleading. A caucasian mouth telling us how to correctly pronounce the company's name... 쉐보레. Looks a little like an English lesson to me, the only problem being that it's teaching a rather different pronunciation to the accepted one. Surely 쉐브롤레 would be an easily pronounceable alternative which might more accurately portray the international brand name? Respectfully, no. The depicted version is simpler, rolls off the lips / tongue, and doesn't overly emphasize any one sound. It would be nice to get a local to chime in here,FWIW. Thanks for your comment, Chris. My wife and some Korean friends I have asked have all found the depicted version very odd.